ES Radiotel by Lorenzo Anzalone. 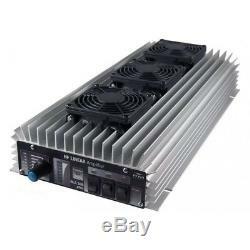 Linear Amplifier RM Italy HLA-300V PLUS. Latest version with black mask and a completely renewed protection system. In this new version, the circuit has been optimized in order to bring the harmonic values to -55 dB and reduce the spurious almost to 0. As official distributor and service center for RM Italy, we guarantee accurately tested products updated to the new version and coming from the latest production lot. Moreover, we're the only official reseller able to provide free and direct assistance on all RM Italy products. Frequency - 1.8-30 MHz Supply - 13,5 Vcc. E rivenditori autorizzati Yaesu, Diamond, Nissei, Kenwood, Motorola, Zetagi, MetroVna, Macom, Intek, Sigma, Daiwa, ecc... The item "Linear Amplifier RM Italy HLA-300V PLUS" is in sale since Thursday, November 16, 2017. This item is in the category "Consumer Electronics\Radio Communication\Ham, Amateur Radio\Ham Radio Amplifiers". The seller is "es-radiotel_it" and is located in Battipaglia. This item can be shipped to United States, all countries in Europe, all countries in continental Asia, Australia.